The Rex Whistler mural 1937. Plas Newydd is a mansion house on the Isle of Anglesey, in North Wales, meaning New Place. It passed into the Bayly family, and between 1751 and 1753 Sir Nicholas Bayly added to the original 15th century building. His son Henry continued adding to the building, Henry being created the Earl of Uxbridge. His son Henry William inherited the estate in 1812, and it was Henry William that served as the second-in-command to the Duke of Wellington during the Battle of Waterloo, Henry William being close to the Freemason Wellington. Henry William lost his right leg during the battle and due to his heroism, he was created the 1st Marquess of Anglesey. One time Grand Master of the Moderns George IV visited Plas Newydd in 1821, and it had been George IV when he was Prince Regent who had made him a Marquess, declaring that ‘he loved him…and that he was his best officer and his best subject’. The mural showing a castle on the island after Windsor Castle. 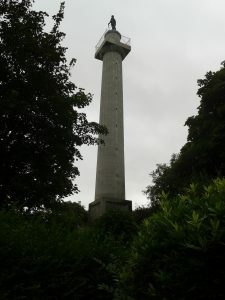 It was the 1st Marquess of Anglesey that constructed the famous column that dominates the Menai skyline, which was completed two years after the battle, and after his death, his statue was erected on top of the column in 1860, the column reminding one of Nelson’s Column in London and Wellington’s Column in Liverpool. The Marquess certainly knew how to convey symbolism, with the sublime ‘Gothick’ architecture of Plas Newydd and the column which symbolised the victory over Napoleon and tyranny, and the sacrifice that was made. The art of Plas Newydd also conveys special symbolism, especially in the Rex Whistler mural which was commissioned by the 6th Marquess. The mural, which was completed in 1937, celebrates the dramatic mountainous landscape of Snowdonia, the seascape of Menai with an added dash of Italian architecture, creating a fantasy scene. The castle on the island is after Winsor Castle, which is shown to have a crack in the walls, said to be symbolic of the state of the monarchy at the time with the abdication of Edward VIII in December 1936. Other artwork of interest includes an array of paintings and prints that celebrate the Battle of Waterloo and the Duke of Wellington, and there is a portrait of George IV. The Cromlech – a pre-historic burial chamber opposite the stables at Plas Newydd. Plas Newydd, on the shore of the Menai. The Marquess of Anglesey’s column.